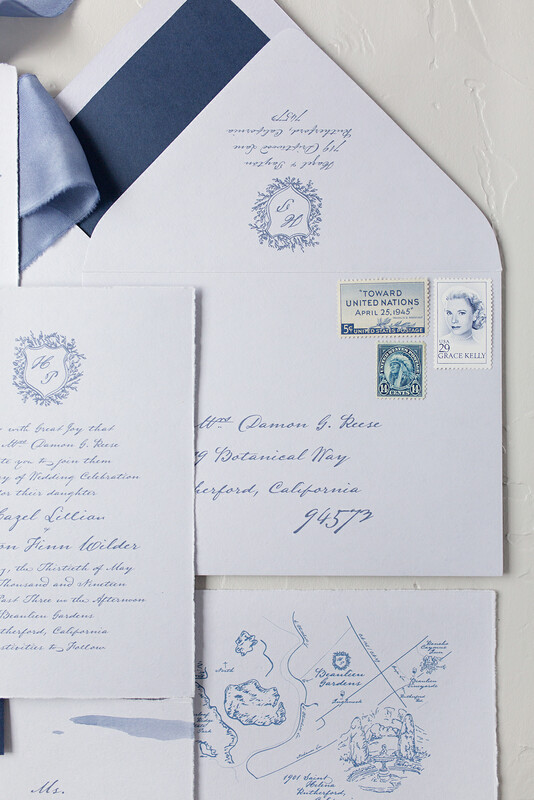 Here are some details on how the production of your invitations will work from start to finish. If you have any additional questions, always feel free to email me! I can't wait to work with you! Found something on my website that you already fell in love with? Great! Let’s switch around the colors to match your wedding and play around with the fonts. Any wording can be changed as well. This option is great if you are wanting to spend a little less money on your invitation suite. Going custom is the perfect way to go to develop a paper story that is unique to you and your fiancé. We will work together to come up with a design that is brand spankin’ new. I have compiled an introductory packet to aid you in narrowing things down a bit so you know what you would like for me to focus on. Please email me and I will send you one straight away. Once you have had a moment to glance through this information and my pricing, the process begins with a complimentary consultation in person, over the phone or by email. During this initial meeting we will discuss the details of your wedding, your style and what you are hoping to portray through the invitations and stationery. I encourage you to share any pictures, ideas and color swatches that you may have collected. In addition, please make a note of any of my services that you may be interested in discussing. You will have the opportunity to view samples of my work, choose colors, paper and embellishments. We will brainstorm ideas and establish a style that best suits your needs. It may be helpful for you to look through the stationery on my website (www.beccamercer.com) to give you some examples of my work. After the consultation, and once you have decided upon which services you desire to move forward with, I will develop a detailed pricing estimate. You can expect to receive this in about 5-7 business days after the consultation. If you decide to proceed, a non-refundable 50% deposit by check or cash made out to “Becca Mercer” will be due before work may commence. Address to mail check will be provided once you are ready to pay. If you wish to pay using a a credit card, no problem! I will create a listing for you on my Etsy store and provide the link. A 3.5% transaction fee will be added to all credit card orders. Upon receipt of your deposit, you are booked for the design and execution of your order. Please note that I do not design anything before a deposit is received. If order is needed within a 4-5 week turnaround it is considered rush and full payment will be due at the time of the order (project may incur a rush charge and depends on my production schedule). Shipping fees and tax will be added to your final invoice. Wedding invitation design generally begins 2 – 4 months in advance of when you need to receive the invitations. When you request timing for an order completion, keep in mind that the wedding invitations are typically sent out 8 weeks prior to the event. After receiving your deposit I will provide you with design concepts in a digital PDF, .jpg or .png format (please inform me if you have a preference). All proofs are done through email or via Etsy conversation. Please check your email and respond promptly to keep the process moving smoothly and swiftly. Production time may be delayed by failure to respond in a timely manner. After viewing your proofs, you will have the opportunity to provide feedback and make changes until you are satisfied. Please be specific in your communication of what changes you desire. You will receive 2 complimentary proofs on Collection items and 3 proofs on Custom work. Any further proofs are an additional $25 fee per adjustment. Depending on your wedding date and project timeline, the process may be slow at this point. Design for wedding day items such as programs, place cards, table number, etc. will generally take place in the months and weeks leading up to your wedding after we have established your final invitation design. All other invitations, announcements and stationery are generally designed and created within a month or two of when you would like to receive them. In order to begin the design process I ask that you provide the necessary wording information, pre-proofed for typos and mistakes. Thank you! A final proof will be provided for your approval. It is your responsibility to thoroughly review each piece to ensure that every detail is correct, including spelling, grammar and punctuation, as well as all wedding details and information. After your final approval is received, materials are ordered and the project goes into production. At this time no further changes can be made and quantities cannot be decreased. It is your responsibility to carefully review your proofs for any errors- spelling, layout, etc. Once you give your final approval any errors are corrected at your expense. Please note that your suite will arrive unassembled. Should you desire for your suite to come fully assembled, please inquire about pricing and we would be more than happy to add this service to your bill. As the project is finished, I will contact you to schedule a pick up time or make arrangements for shipping your order. I will send you a final invoice that includes tax and shipping. Final payments are due prior to shipping or at the time of pick-up.